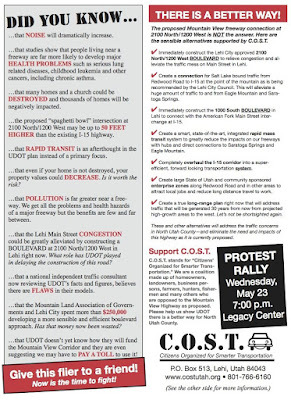 Utah Valley Earth Forum (UVEF.org): Protect our Kids From New Freeway Pollution! Protect our Kids From New Freeway Pollution! As several recent scientific studies have shown, children living near freeways are at extreme risk for severe health problems. For example, children within 250 yards from a freeway are 8-times more likely to develop leukemia and 6-times more likely to develop other cancers. In addition, children aged 12-18 living within 500 meters from a freeway are at highest risk for permanent deformities in lung development. There are also many other studies. In the beginning of planning, UDOT appeared to be looking at new rail transit along 5600 West with the Mountain View Corridor studies. However, we have recently found that they have scrapped any new transit plans for this area until over a quarter of a century from now and have proposed the freeway to be even wider. 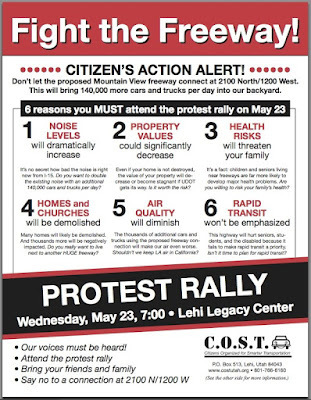 Transit and non-freeway road expansion is the only solution to keep our children safe from these concentrated pollution threats.